For those of you making the transition from the Viira Outlook Suite to the new generation of Viira cloud-synced apps we have provided a migration tool make moving your data a synch. First make sure to download and install version 5.5.3 or later of the Viira Outlook Add-In. (To check what version of the Viira Outlook Add-In you have installed you can either go to Control Panel->Programs or select “Send Feedback” from the menu). Select Import Viira Outlook Suite Data from the menu. 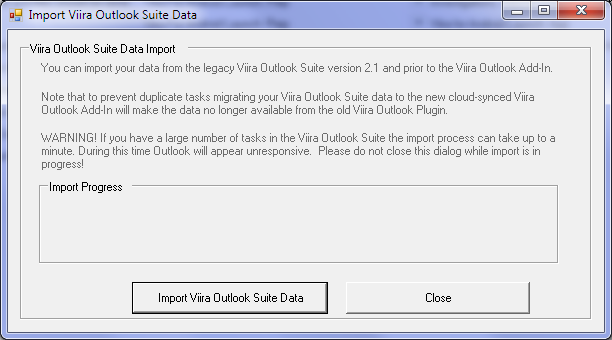 This will open the Viira Outlook Suite data migration tool. Note that if you have a large number of Outlook tasks or Viira Outlook Suite tasks the import process can take more than a few seconds to import so please be patient and give the import tool the time it needs to complete. 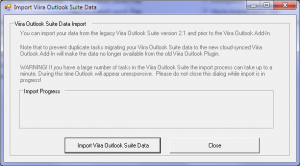 You can perform this migration not just on the same PC on which you have installed the Viira Outlook Suite in the past. You can also perform the data migration on any another PC with MS Outlook installed and the Outlook tasks moved/migrated/synced from the original PC on which the Viira Outlook Suite was installed. This is because of the way the Viira Outlook Suite integrates deeply with the native tasks - if you move your native tasks over to another PC all the data will still be there to import.